A novel variational derivation of the Navier-Stokes equations for incompressible flows is presented and discussed. The Lagrangian density is obtained from the exergy balance equation written for both the (Lagrangian) steady and quasi-stationary isothermal flows of an incompressible fluid. The exergy of a fluid mass (composed of a kinetic, a pressure-work, a diffusive, and a dissipative portion, the latter being the result of viscous irreversibility) is derived first, and it is then shown that a formal minimisation of the exergy variation (i.e. destruction) generates, without recurring to “local potentials”, the Navier-Stokes equations of motion under the given assumptions. The acceleration being held constant, the proposed variational method can be classified as a “restricted” principle. The problem is also briefly discussed both in its historical perspective and in its possible formal and practical implications. ISNAD Sciubba, Enrico . "Flow Exergy as a Lagrangian for the Navier-Stokes Equations for Incompressible Flow". 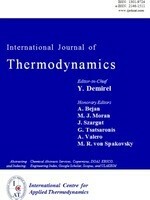 International Journal of Thermodynamics 7 / 3 (September 2004): 115-122.